A Melbourne PR consultant has created a pilot episode of a TV panel show which he believes could be a Gruen for the public relations industry. 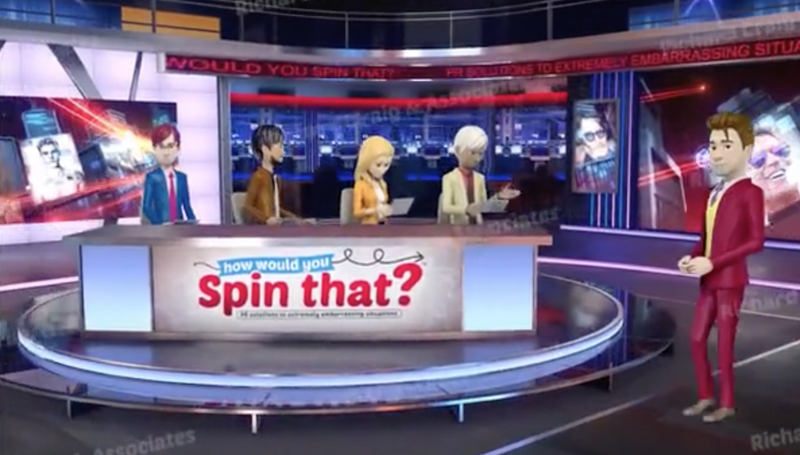 Richard Craig, who says he has more than 20 years experience working with brands like Shell and PwC, hopes that one of the TV networks will pick up his idea for “How would you spin that?”. The idea features four PR practitioners discussing hypothetical crisis management scenarios. While the pilot is animated, the final version would feature a cast of real PR practitioners. “Asia Pacific PR whizz” Felix de Valen who claims that “In Singapore, Sydney and Hong Kong there’s always some sort of stuff up happening … and that keeps my cash register ringing”. And “tabloid king the UK” Charlie Barnes, who tells the audience “People sticking their private parts where they shouldn’t be is food and drink for my table”. According to the format, the panelists are each awarded points for the advice they give on the hypothetical crisis of a high profile, vocal environmentalist software multibillionaire who destroys hundreds of acres of untouched coral on his private boat. The analysts “spin that” by “having a couple of hundred thousand deposited into my Coutts bank account before I put down my glass”, saying “it never happened, I’d call it a mass hallucination” or “I’d pay some dodgy university… to put out a report saying that that stretch of coral was already dead because of global warming”. Craig told Mumbrella he was in discussions with PR firms and the “heavy hitters” regarding their involvement, and is currently pitching the program to “major” TV networks. He said: “The very popular Gruen program is essentially about advertising. Our program is about PR. While there is some overlap at the centre, they are two separate management and business functions. The world’s biggest ad agencies include firms like BBDO, McCann, J Walter Thompson. The world’s biggest PR firms are names such as Edelman, Weber Shandwick and Burson Marstellar. The program will be funny, entertaining and different, Craig claims. Gruen, which is produced by CJZ for the ABC and has been running for nine years, focuses on the wider communications industry and features four practitioners explaining the strategy behind the issues. It includes a regular segment called “How do you sell”. Craig says “How would you spin that” is a completely different idea because it focuses just on PR, and he has applied to trademark the phrase. That’s awful. Like awful to watch and just awful for the PR profession. Stereotypes meet appalling advice. so the host is standing to the right, not sitting in the middle – thats the difference? This is just bad. But given the quality of Aussie tv, someone might buy it. I hope not. Confirming PR stereotypes in a funny way… I would definitely watch this! Wow, even in the animated version it’s mostly men, whereas PR is an industry heavily dominated by women. Out of touch. A terrible idea and completely unhelpful to the PR industry…and unrepresentative of this industry today. A total dis-service to the industry and all who work so hard within it. I hope it never sees the light of day. What has the world done to deserve this? No. Just no. That video was horrendous. Bad stereotypes, lacking in diversity, negative female representation and poor scripting. As well, PR strategy isn’t a spur of the moment decision on how to respond in a knee-jerk manner. The are many factors that come into a decision and it would definitely not make good tv. I’d rather see a TV show on vendor procurement – that’s really saying something! Much truth is spoken in humour. It will be a boon for PR because more and more people will realise when PR is needed. More women is a good idea. The old fuddy duddies dont realise the program needs to be popular and humour is the way to achieve that not a starchy biblical approach. The situation created will allow some really clever minds to think pf brilliant ideas. Tired of the PR stereotype, confirms my drive to get out of the industry, and a cliche that the female character is getting plastered – yes it’s a profession that will drive you to a drinking problem but that actually isn’t a laughing matter!! Hilarious! Looking forward to seeing the actual programme. Pretty sure this should have been filed under ‘Dr Mumbo’. I think it’s a great idea. Why would it show the PR profession in a bad light? It could be the opposite and show the the logical, strategic thought behind it looking after important stakeholders. It could also ahow how clients sometimes won’t accept the hard advice to do the right thing !